The gall is not mentioned in Houard (1908-1913) or Dauphin & Aniotsbehere (1997a). The gall fits quite well in the description in Houard (1923a of an unnamned eriphyid gall on “Zizyphus [orthacantha]”, now Z. mauritania, the Indian Jujube, that belongs to the same plant family and is widely distributed from Africa to China. Apparently, the gall is new to the fauna of France. 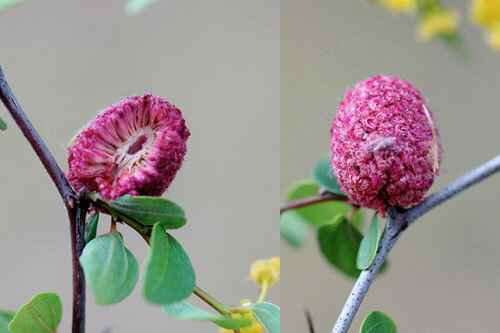 Conceivably, the gall-causer on jujube might be Aceria ghanii Keifer, 1966 (cf Charanasri & Kongchuensin, 2001a); the gall is briefly described and not illustrated; and more species might be involved of course. Charanasri & Kongchuensin (2001a), Dauphin & Aniotsbehere (1997a), Houard (1908-1913, 1923a), Keifer (1966a).